There has been a lot of interesting discussion over the past several weeks concerning the cyclical state of the market. Most of the commentary has been based on what I refer to as the trough synchronized, simple harmonic relationship, time domain approach to cyclical analysis. I thought I would take this opportunity to throw my hat back into the ring using the spectral approach of cyclical analysis. I believe most of the current uncertainty about the cyclical state of the market is due to the the phenomena Hurst referred to as amplitude modulation of the cyclical components. The math can be somewhat complex but the effect is readily apparent. It is most troublesome when it occurs in the longer waves. When the amplitude contracts, it becomes very difficult to visually identify the cyclical lows in the price action. 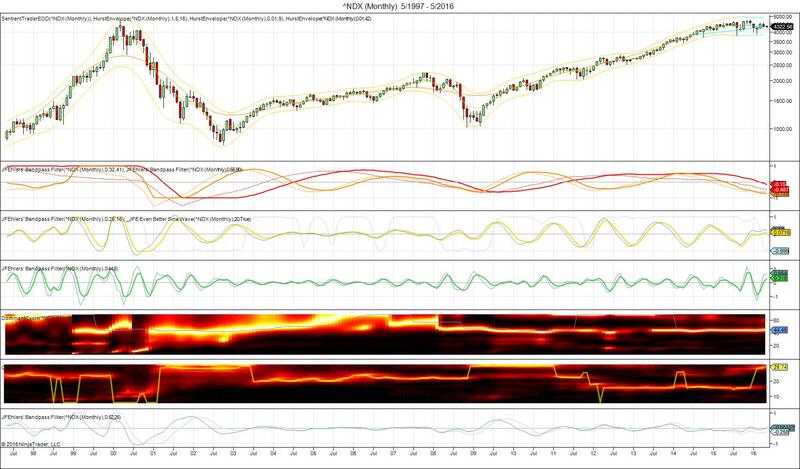 Even spectrally when the amplitude drops below a certain threshold it becomes difficult to isolate the price wave. The weekly chart of the S&P 500 below illustrates the effect. The dominancy envelope shown is the sum of the waves longer than the 80 week wave (i.e. sigma L). Instead of using Hurst’s constant width approach, it is constructed so that it expands and contracts with the amplitude of the waves contained within the envelope. 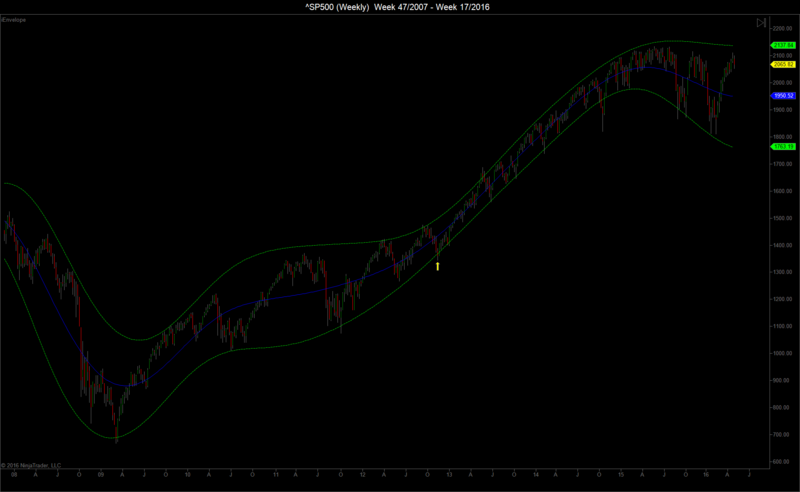 Ever since the prior 4 year low (yellow arrow) the amplitude of the 80 week wave contracted greatly as evidenced by the narrowing of the envelope. I have commented on this in prior posts. Over the last several months it can be seen that the envelope has expanded greatly (hence the title). This is due primarily to the expansion of the amplitude of the 40 and 80 week waves (not shown). The chart below is a daily chart of the ES futures. The two price waves shown at the bottom of the chart are the 40 day and the 20 week waves. The price action is cycling down into the next 20 week low. Unfortunately it is impossible to forecast as to whether the 40 day low will straddle like it did in February, but a certain pattern suggests that it might. There is usually very little difference between a phasing analysis using the time domain approach and the spectral domain approach. You will notice however that the spectral approach paints a significantly different picture than the analyses presented by David in his most recent webinars. As mentioned at the beginning, I believe this difference is due to the large amount of amplitude modulation currently present in the market. I would advise caution. Barring a decline of Biblical proportions over the next few months, there is a very high probability that the index has seen the absolute low of the 4 year wave. There is some unusual phasing of the longer waves which most likely will keep me on my toes for the remainder of 2016. Great post. Thank you for sharing your spectral work. I have to agree that the larger cycle lows are most likey behind us (18 month, 4.5 year and even possibly the 9 year) for the $SPX. The phasing we discussed in January, and the use of shorter cycle periods of 14 month, 42 months and 7 years aligned with a Q1 low (I believe your spectral work would confirm this). The one measure I watch is market breadth (eg. $NYSI – McClellan Summation) for confirming cycle lows. We’ve seen a very strong move thus far in 2016 which corroborates the importance of that low. However, I’m not sure how the $SPX will trade over this 40 week cycle, other than it should leave a right translated cycle high. I’m trying to gauge where we’ll see the next 20 week low and right now it could be imminent (like this week, possibly as early as tomorrow) – if we see a sharp decline and reversal. Your 5 week spectral work confirms the dilemma of the January/February double bottom lows. The $INDU made its low in January (now in its 15th week off the Jan. low) while other US indices made final lows in February. So which low to use to project the next 20 week cycle low? 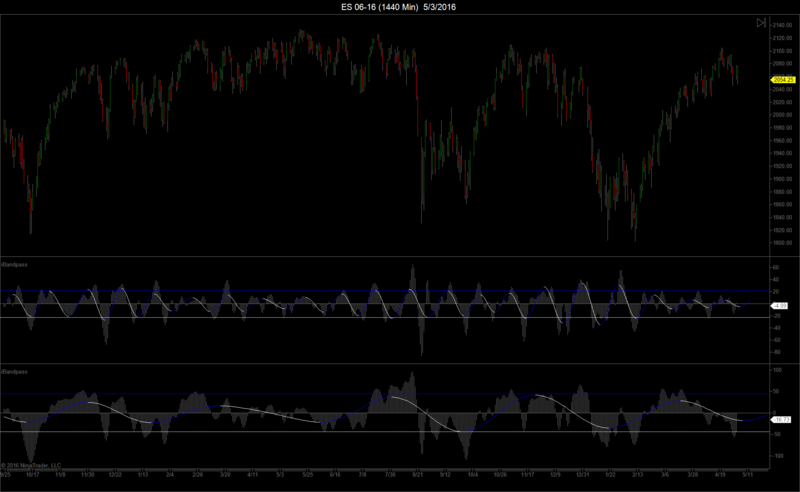 And as you’ve suggested, if we’ve seen the 4 year cycle low, then cycles should run a little shorter. I’m not really keen to chase any short trades here and actually looking for longs with confirmation. What really stumps me right now is the $USD. John – first hat off for your forecast that the cycle are running shorter and to expect 9 year cycle low early this year. It was spot on. Good observation market breadth behaves like in a bull market which means there will be more to the upside and we have important low behind us. I bet 9 year nominal cycle which runs like a clock 7 years length since 1980-ties. McClellan Summation around 1200 and strong A/D making new highs – you can forget about bear market. I do not understand your confusion about the USD. Your last analysis was perfect. DXY one small leg lower was expected to finish a zig-zag correction running for more than a year, gold made it’s M pattern as expected… no surprises I do not see a need to change something. I expect final leg higher… probably 9-12 months and in the mean time commodities will correct lower. 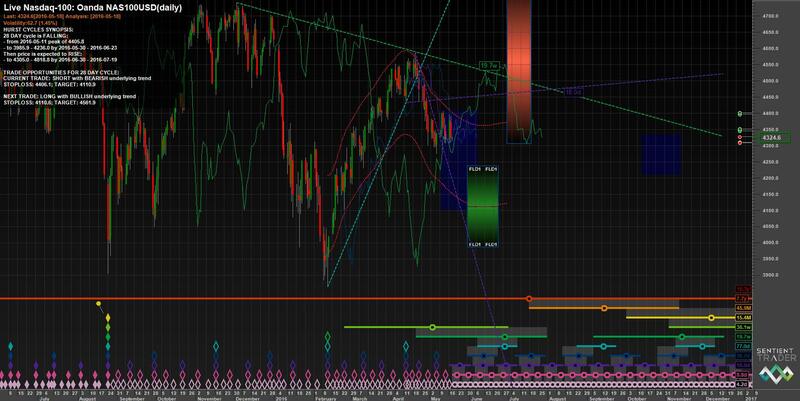 Looking at USD/JPY I see the same – 4 year cycle low, one final leg higher and major 4/8 year cycle top. Only if DXY starts plunging below 92 than we should throw the analysis out of the window and start all over again. Ever since my first post I’ve advocated the position that Hurst’s nominal time domain model is too long for current market conditions based on his filter. Nothing has changed. One of the “canaries in the coal mine” that I use is a cyclical analysis of the cumulative advance/decline line, similar to the McClellan summation, for a heads up on major turning points. The most recent low was one of those very rare occasions where the 80 week wave low did not synchronize with the 4 year low, depending on how they are calculated. The 40 week wave has a tendency to be somewhat of a wildcard. However the 20 week and shorter waves will keep you on the right side of the trade 99% of the time. Based on the projected average of the 40 day wave it is due for a low next week. Keep in mind that there will be some deviation from the average period. VTL’s or FLD’s of the shorter waves will get you in very close to the cyclical low. Spectrally the $USD (and correspondingly the EUR/USD) is very simple. I’ll send you a chart. Can we get an updated look at that 7 year cycle chart as I also believe that is more accurate as well. Thank you all for sharing the comments! I have been using mostly traditional technical analysis and as I look to combine this with Hurst cycles, I happen to visit your site from time to time. Could you please William contact me on hurst@friends.ee, I would appreciate to have some brief discussion with you on USD position. Certainly breath is important measure of the market health and in the comments are correctly pointed out, that NYSE cumulative AD Line has made new high, the same goes for summation index. However if we look to other breadth measures, there are strong divergences. For example NYSE AD volume line confirmed the 2015 spring AD line new highs, but is now lagging strongly without new highs. Also AD line covers all issues traded on NYSE, but this can be misleading. If we would like really to feel the health of the stock market, then some chartists argue, that better is to look to common stock only AD line. And if we look solely to common stock AD line, then it has not made new highs as well…. Which in ST does not give an VTL confirmation of an at least 40w trough in february, and dives into a 40W trough soon. There is a 18Y trough imposed in 2009 with an expert model, which I consider more appropriate for underlying trend generation when used with a shorter wavelength nominal model derived from the spectral analysis than using the standard nominal model in ST.